Paula… your website / blog is very helpful, and I’ve loved reading about D&B history. 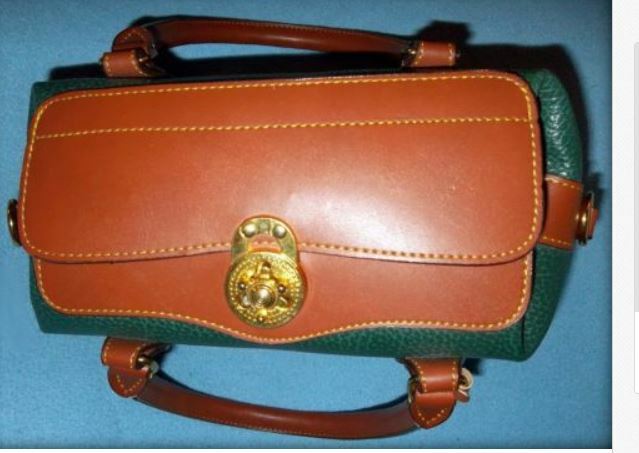 I purchased what I think is an early vintage Dooney & Bourke but I can’t find my style in your listings or archives. It is so cute and I’m hoping so much it is real because I’ve never had one, but always hoped to. I want to go out in public with confidence and not have people snicker that I have a fake and don’t know it. 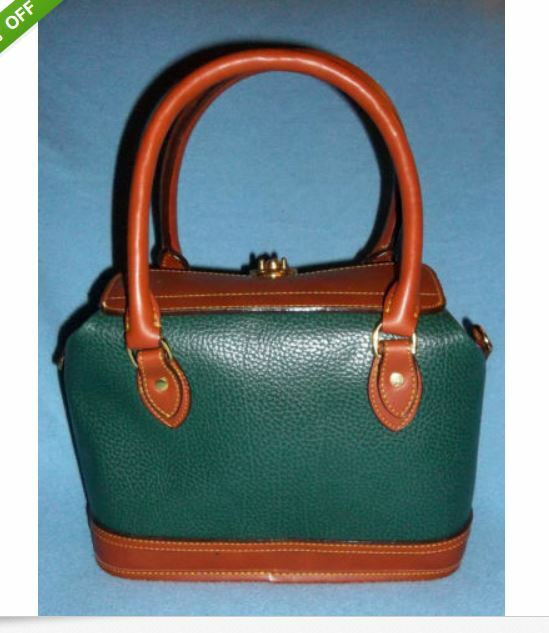 The style screams vintage cute little purse but with an over the shoulder long handle as an option. 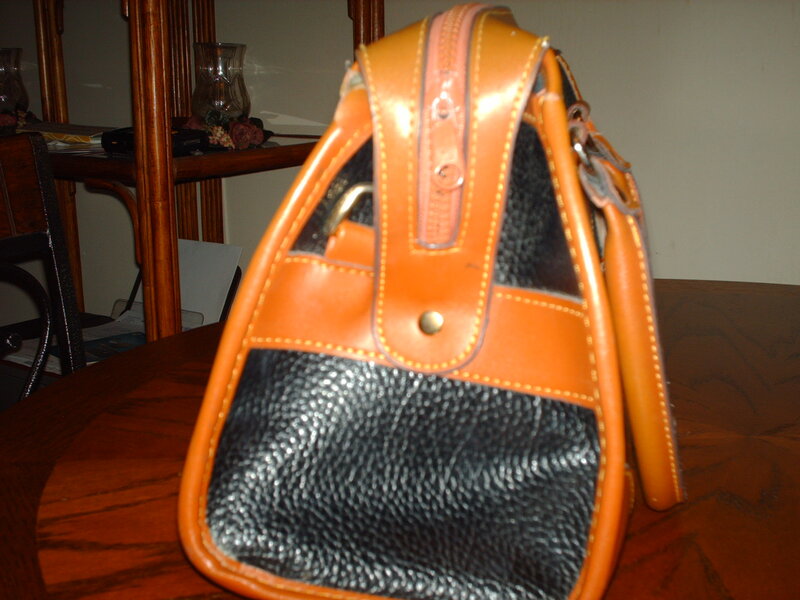 It is a wedged style from the front, with a handle on the top; it tapers out and gets about two inches wider as it goes downward to the base. 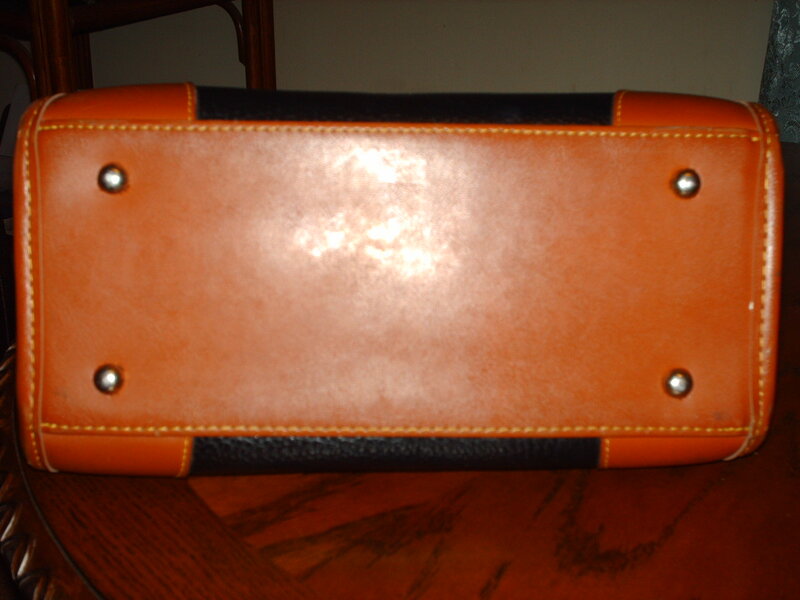 The base is about 4 x 8 wide and flat with 4 feet. 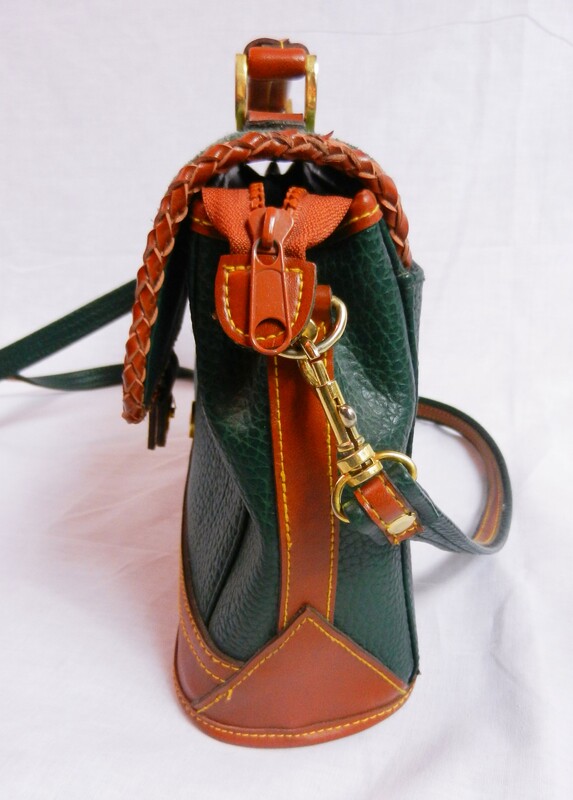 The purse stands completely on its own without caving in or looking like it will tip over. From the side it is shaped a little bit teepee style and also tapers out with about the same two inch difference. 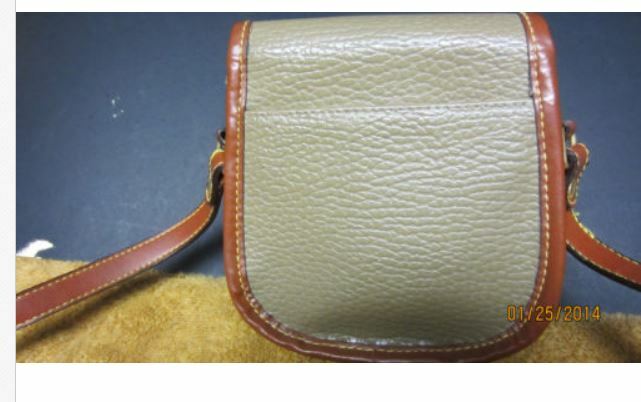 It is bone with medium tan contrast and seems to pass the test as far as looks and many details you say to look for, but after searching your site and several others, I do not see this exact little purse. 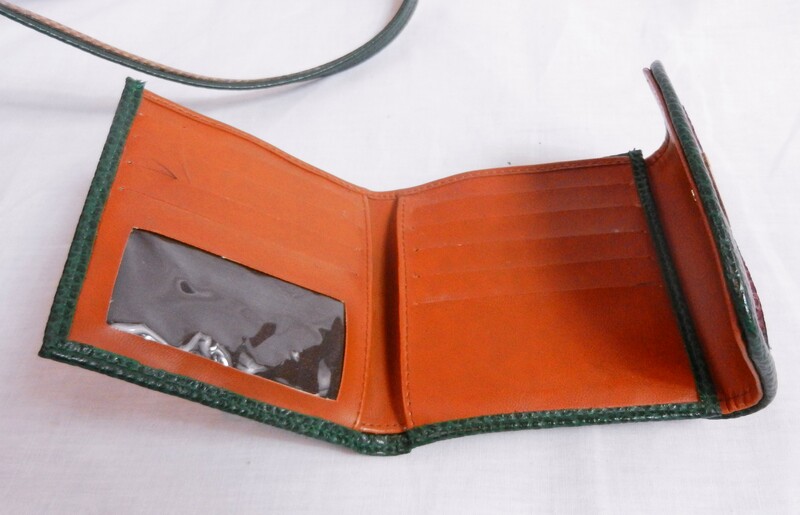 It has a “fishing bag/tote” shape to it like some items in your inventory, but the latch is not like your similar examples… yet it is like other items in your inventory. In other words, I see characteristics that are in many of your samples, but not all together. These are the things I’m not seeing that your blog says to look for. The words “solid brass” on the metal parts, no tag inside. 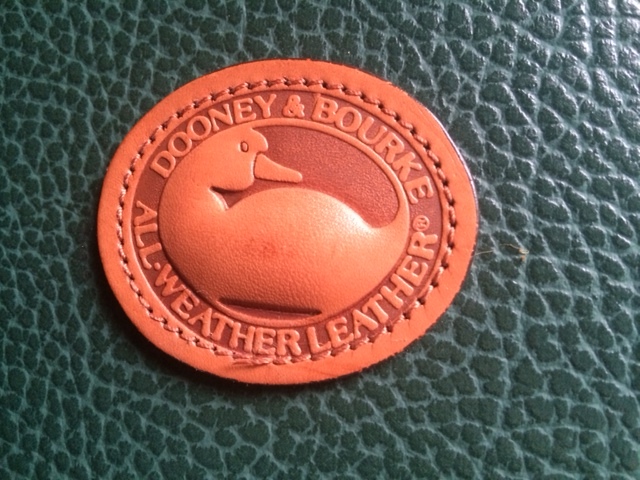 It says ALL-WEATHER LEATHER and has the distinctive pebble-grain texture, but does not have a soft and supple feel as described on your History page. 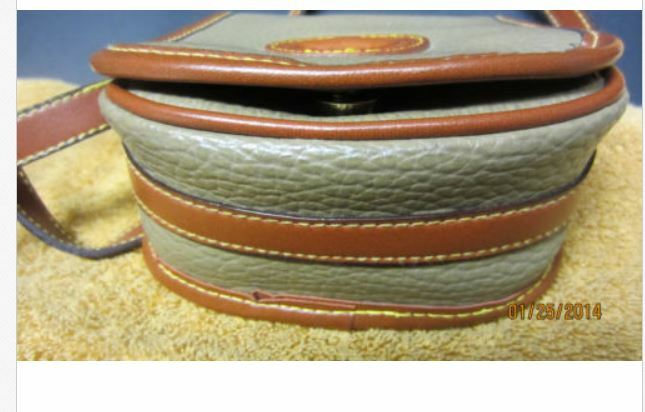 When you unlatch the front and lift up the flap, there is lining of what appears to be suede and I’ve not seen that mentioned in your “Q&A.” The inside bottom is pebbled leather as well as the inside back “organizer” area, but the inside sides and inside front are the same suede type lining. 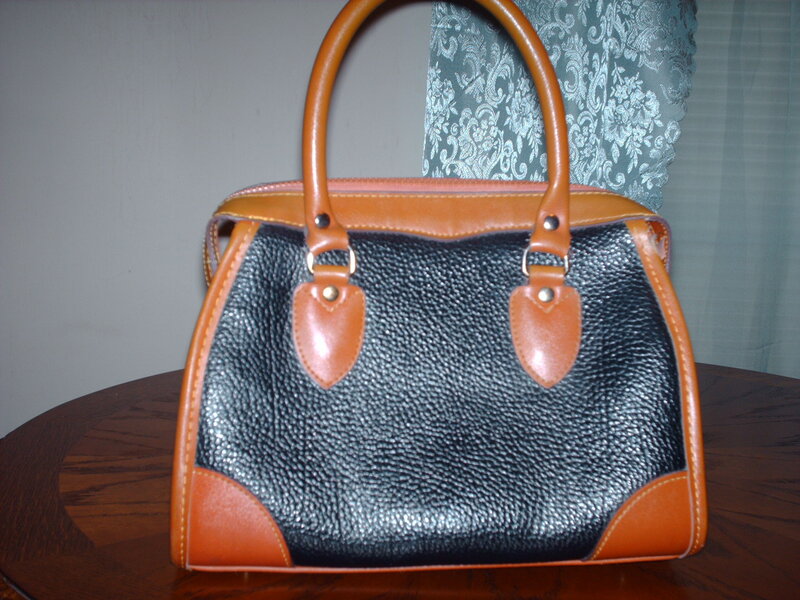 I purchased it from an Assistance League thrift store that sells nice items. They would not try to cheat anyone; if it is not genuine, it would be for not knowing. I paid $40. 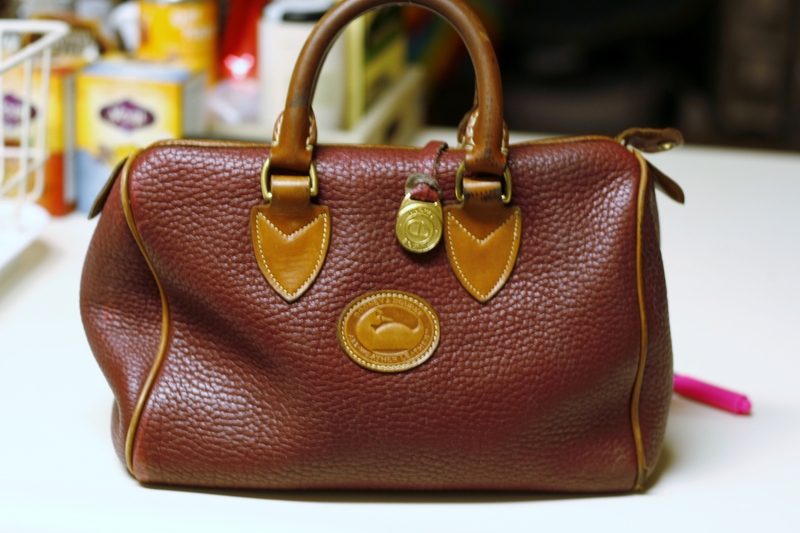 It was a passion buy because it has such a cute and old-fashioned shape and style that “turns heads.” It turned mine in the thrift store, then I came home and read your blog on how to tell the difference. Now I’m keeping my fingers crossed. 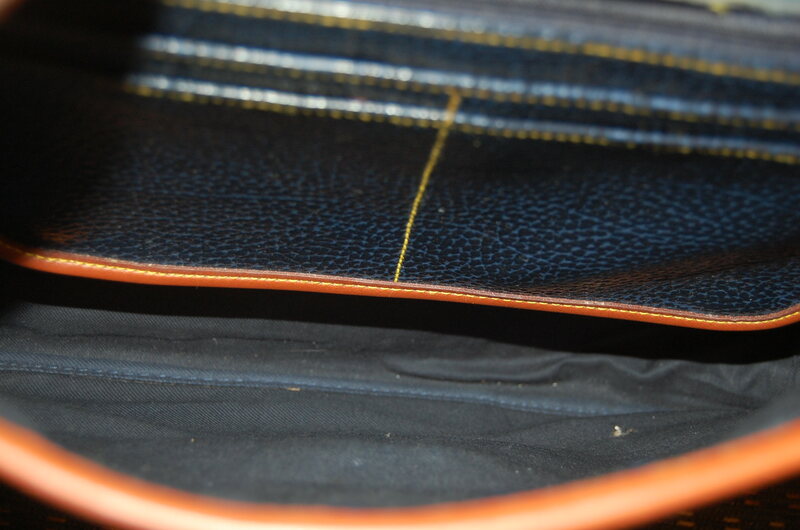 I have very good detailed photos but will only send them if you need (and according to your blog instructions). Thank you for having a very informative website. The education you are giving the public is very appreciated. 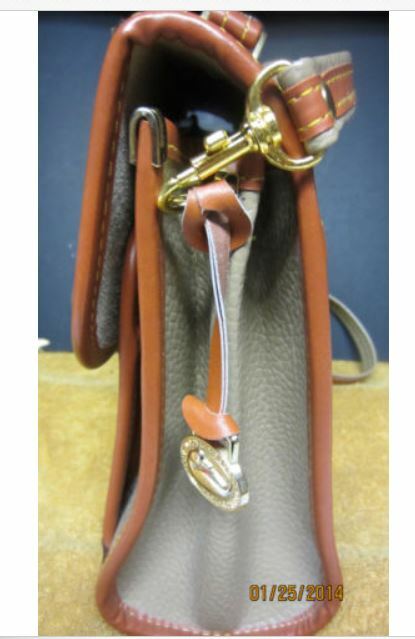 The uncertainties or issues may be due to age and wear, but I am concerned about things like patina change to metal, soil marks on strap and inside, and the emblem detail is hard to get due to reflection and shine, but hope I have enough details for you. 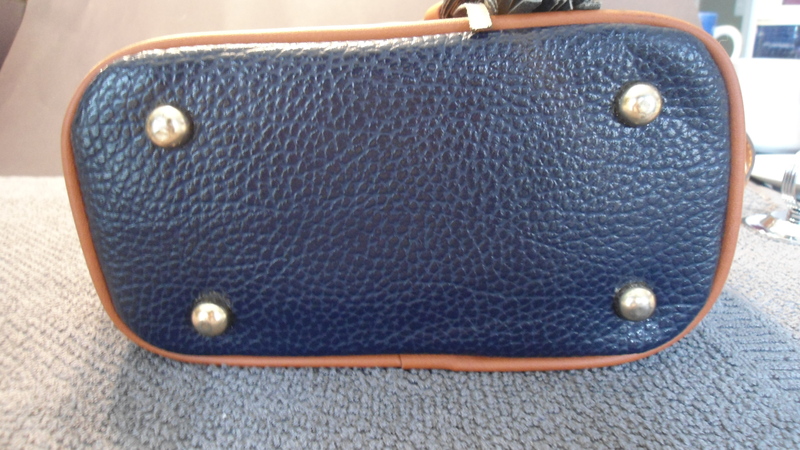 Sure looks like a sweet little purse but my daughter, a DB enthusiast who owns two purses, is skeptical. I’ve never owned one, and know nothing. I thought I’d consult the leading expert! 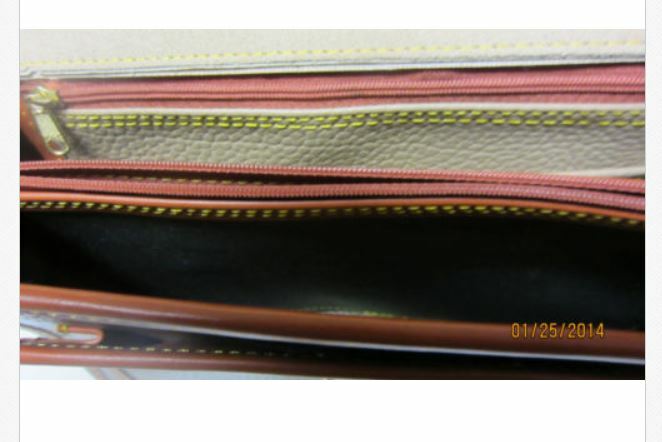 When I receive such a nice letter and good photos, it breaks my heart to inforrm you that your bag is a fake……….well………….at least you can be proud that your daughter’s skepticism was well founded. 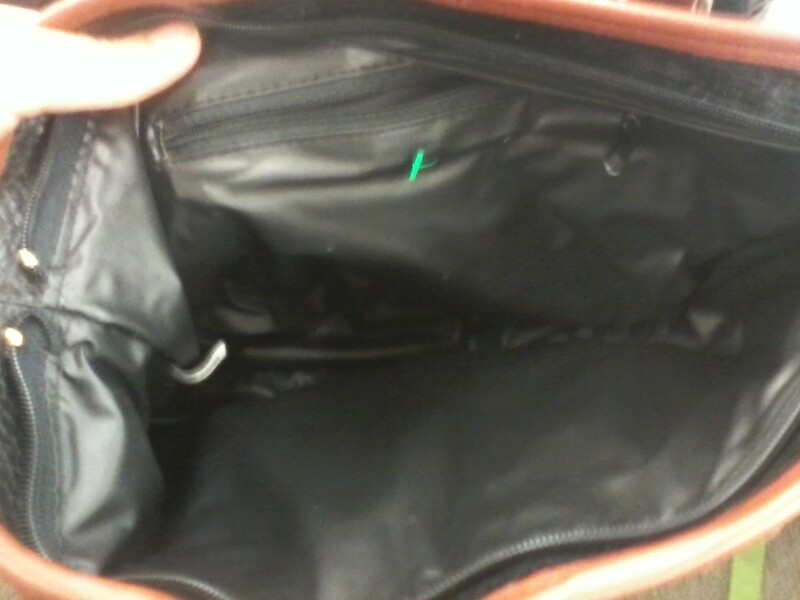 And as far as the store not misrepresenting the bag, I’m sure that is true. I’ve found that in 90% of the cases, people just don’t know -they are not trying to be deceitful, they just don’t know how to tell one way or another. 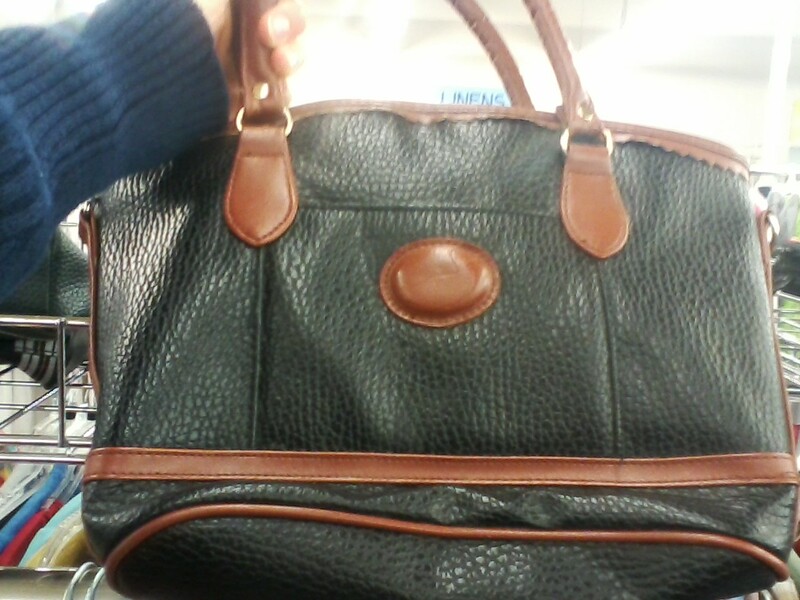 This is a fake bag. 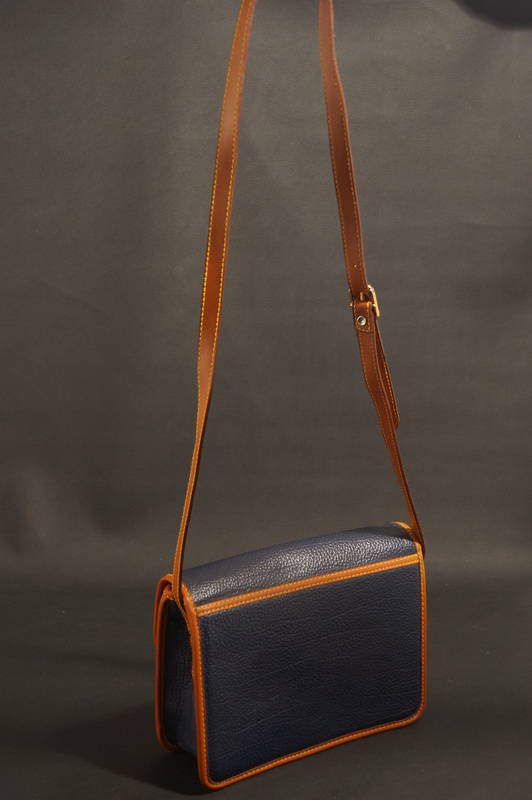 And I would have to call it a fake hybrid because like you say, it has elements from various bags, but nothing is quite right. 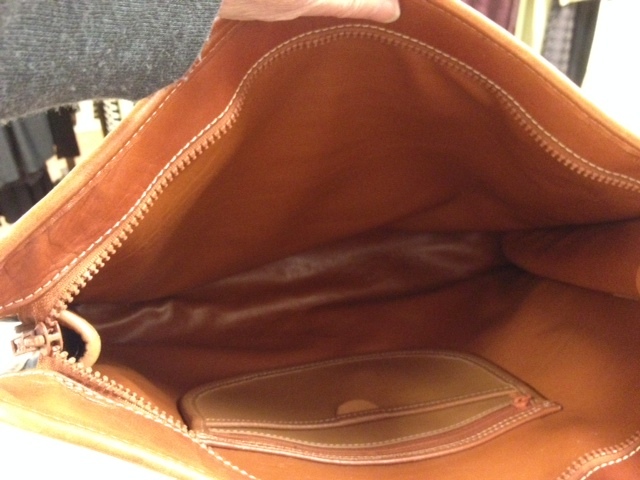 The interior pockets should be of tan leather, not white like yours. 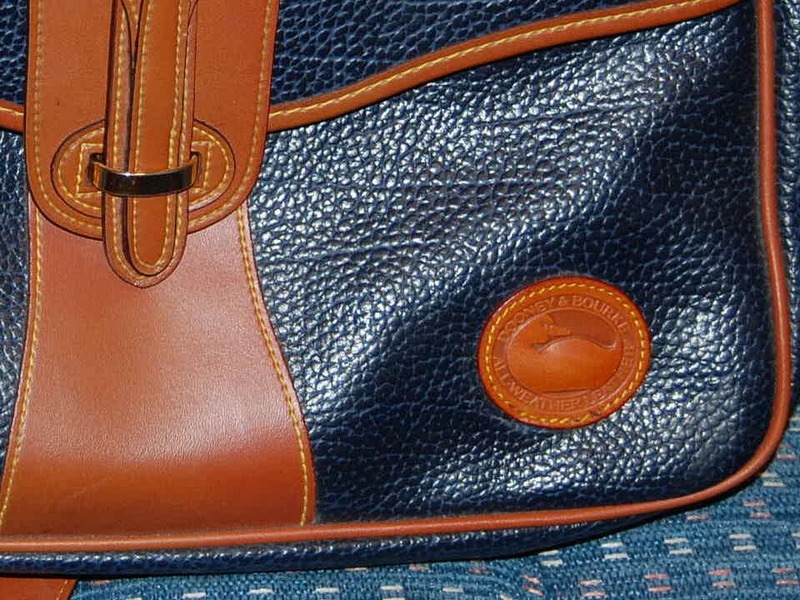 There are many areas of your bag that appear to be vinyl, such as the trim. 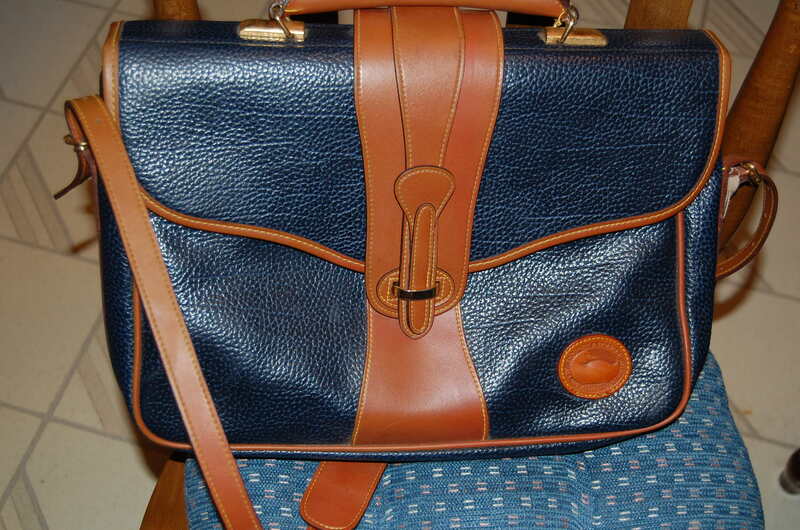 The way the various parts are riveted together is not in a Dooney & Bourke style. 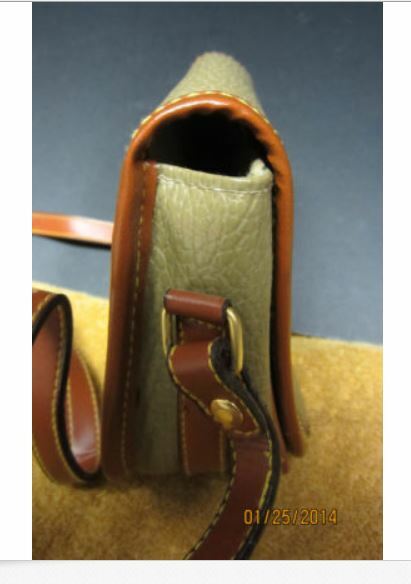 For example, the carrying handle is usually like this. 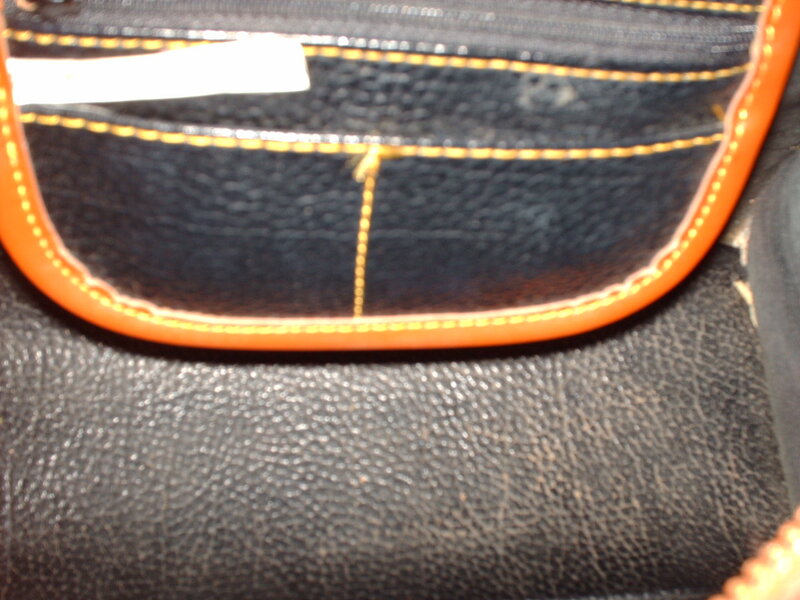 The reinforced corners really only appear on a few bags such as this Small Carpet Bag. 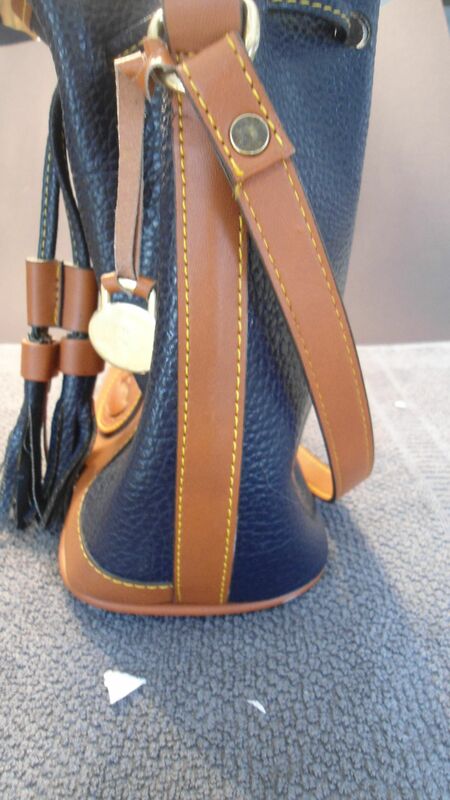 In addition, the metal feet on the bottom are not like those on a Dooney & Bourke bag. They should be brass. 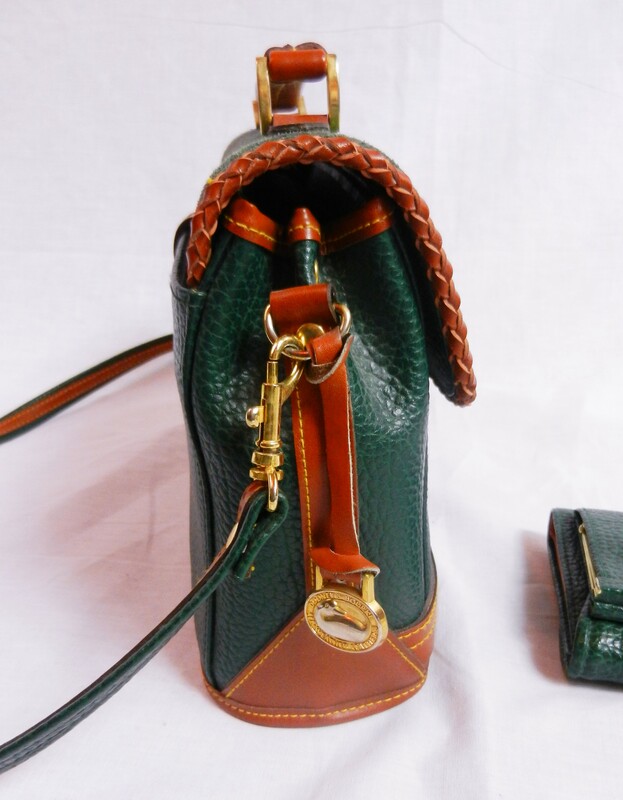 Most noticeably, however, is the front latch treatment, markedly NOT Dooney & Bourke – there has not been anything like that on any bags to my knowledge and experience. Again a hybrid feature. 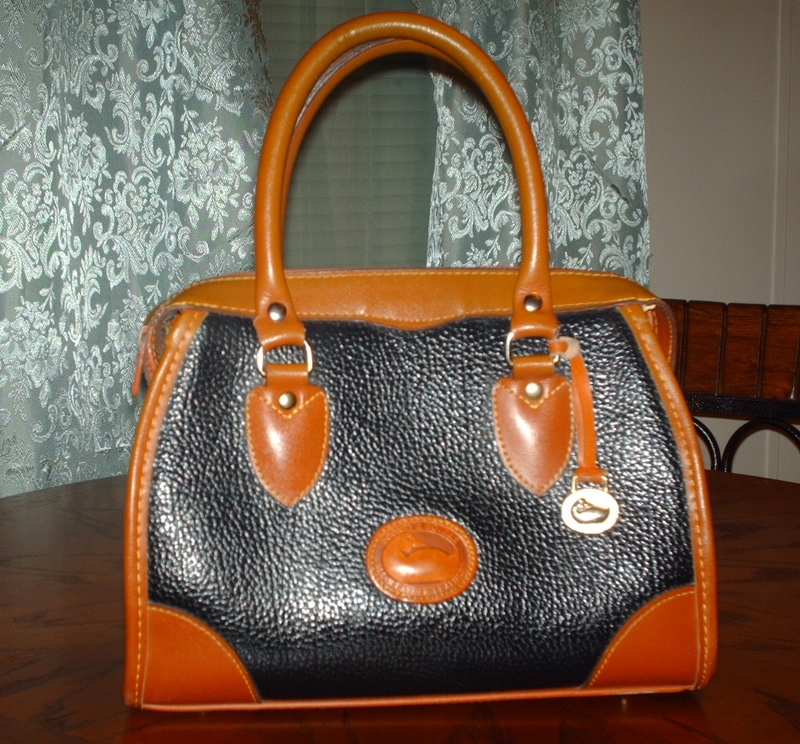 I can’t even say what bag the counterfeiters were trying to copy. 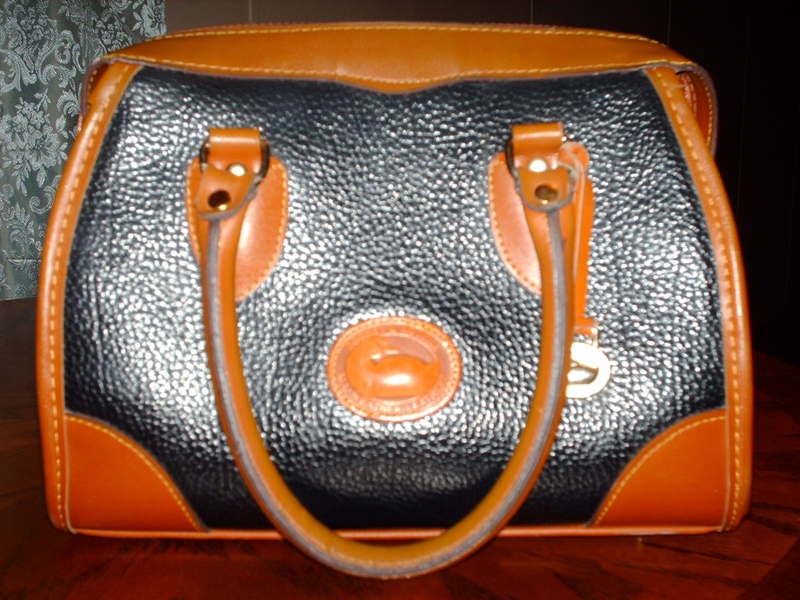 So I am sorry to say, you have a fake bag. Tell your daughter she has good instincts ! Next time if the opportunity allows, write me before you purchase. I’d be happy to help. 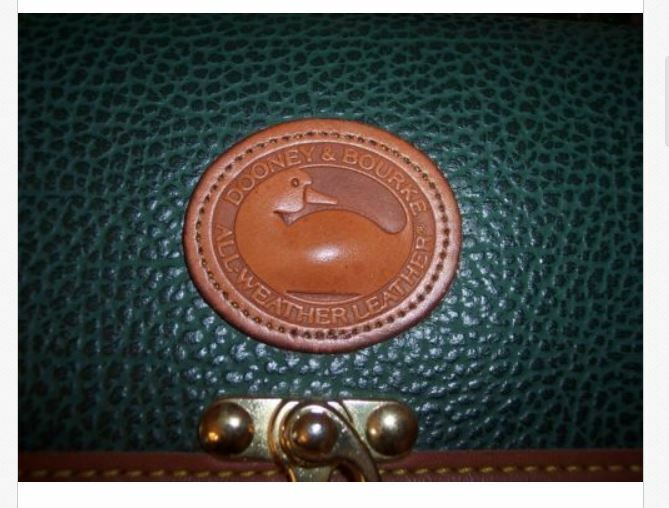 This blog is a labor of love of vintage All Weather Leather Dooneys and I am always glad to help with identifying and authenticating bags free of charge. 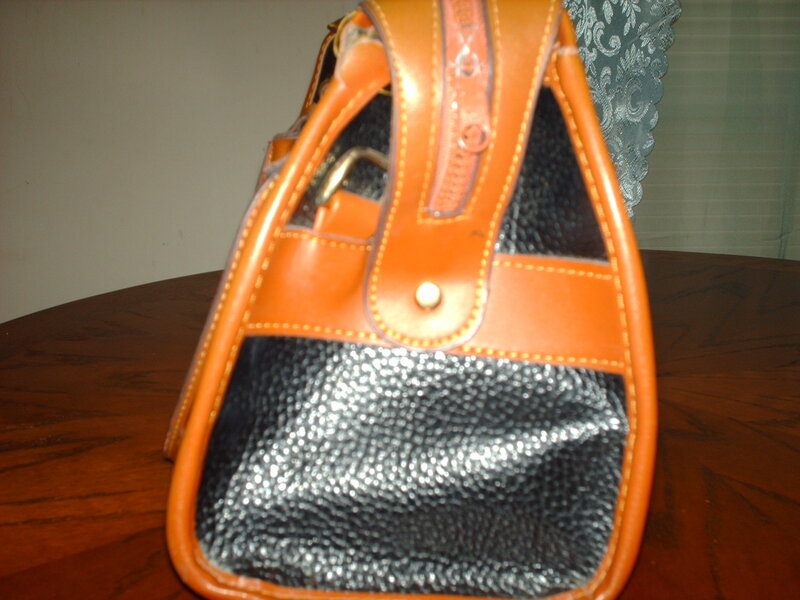 It is my way of contributing to the knowledge base out there in hopes it helps prevent fraudulent sales from occurring. Many of the answers are already on our website or this blog, so enjoy your browsing ! 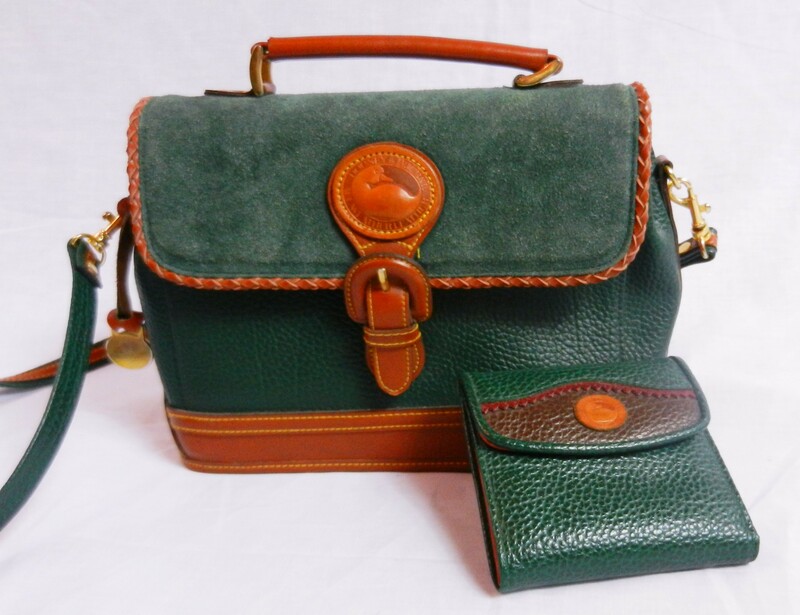 Is this green bag and wallet authentic Dooney & Bourke? 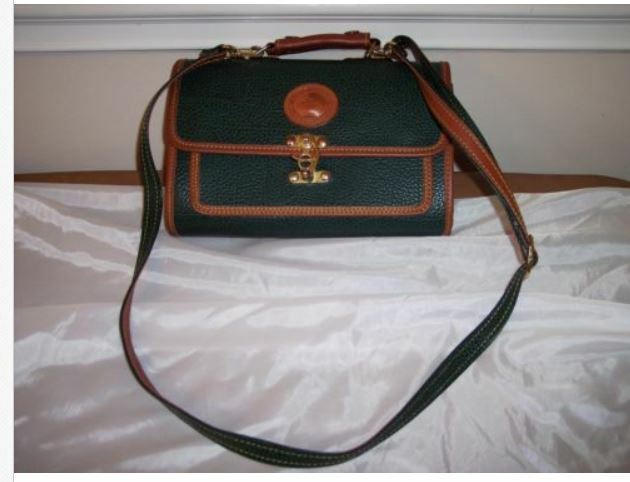 I recently found a very nice vintage-ish Dooney & Bourke crossbody bag with a matching wallet at a thrift store for $12.50. 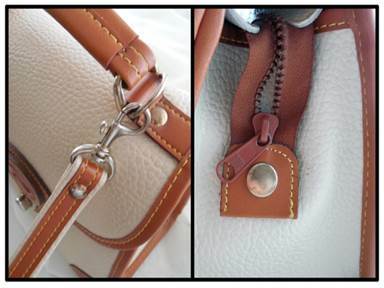 The bag is very well made, but it does not have a “made in” label inside. I can’t tell if it was removed or never there at all. 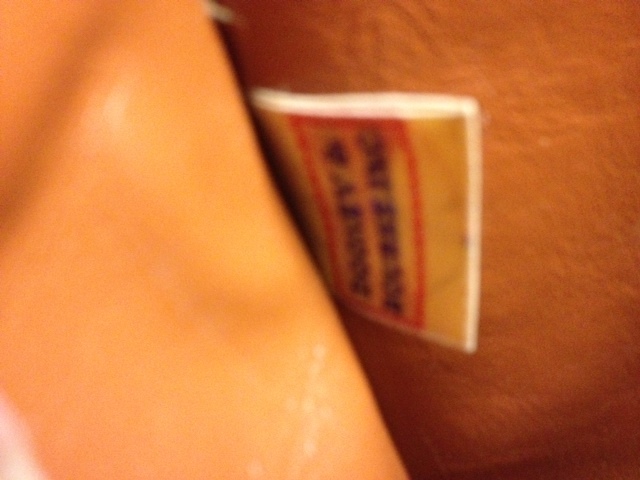 The wallet does have a white cloth label that says “Made in China”, but nothing in the bag. 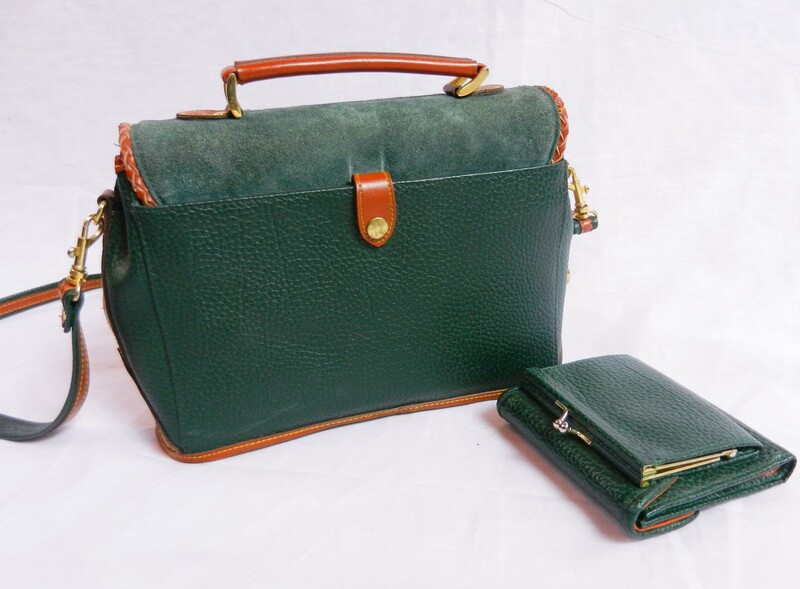 The bag is green and tan with a combination of leather and suede and has black interior with 3 compartments. I’d love for you to take a look at it and tell me what you think of the pair. Did I do good for $12.50 or did I just throw money away? Sorry Scott but you have two fake items. 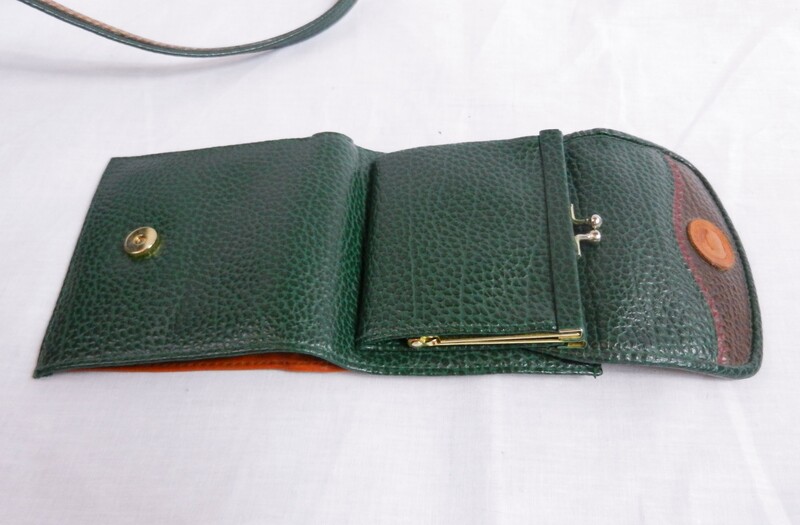 I’m not sure which bag the counterfeiters were trying to copy as I haven’t ever seen anything like that but the wallet is a knock off of the Teton wallet. Click on this photo to see details. 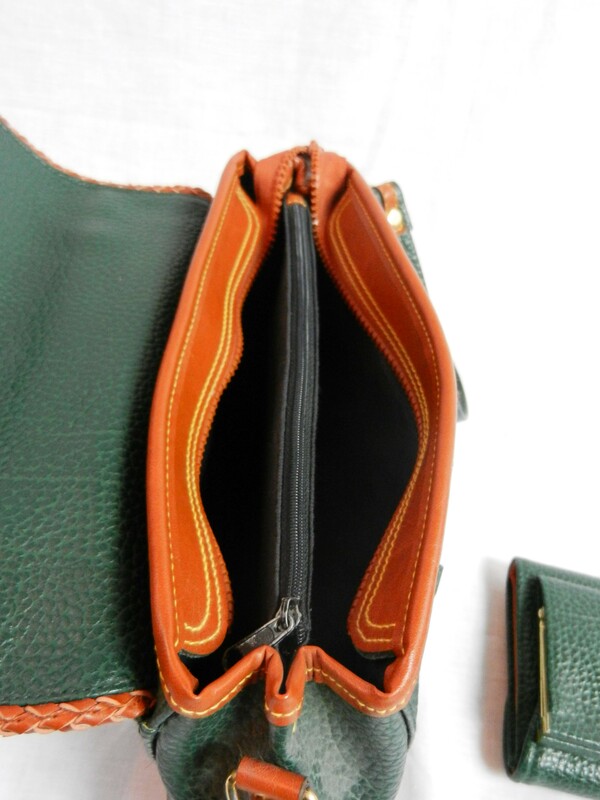 Interior of authentic Dooney & Bourke wallet. 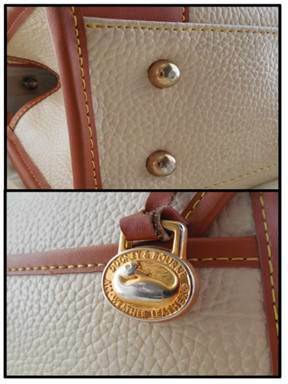 In the effort of saving time so I can get to other questions in a more timely manner, I’ve replied to those of you who asked about these bags, telling you they are counterfeit bags, not authentic Dooney & Bourke. I commend several of you who wrote asking if they were authentic BEFORE you listed them on eBay !! That is a very good thing – now you know they are not authentic and should not be represented as such. 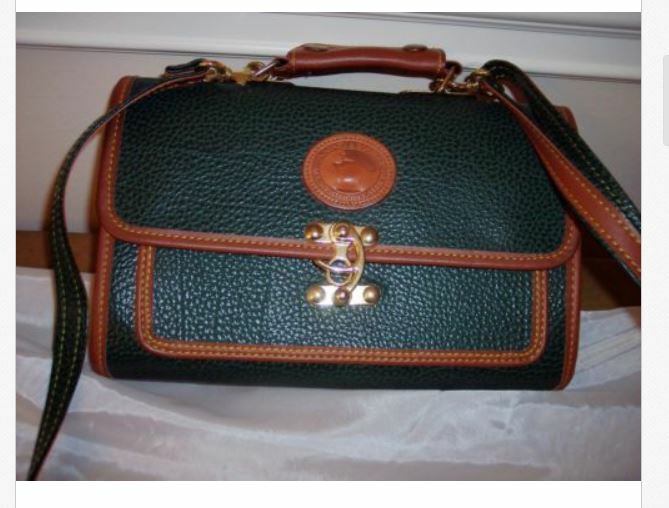 For those of you buying on eBay, beware, there are MANY MANY counterfeit bag there. 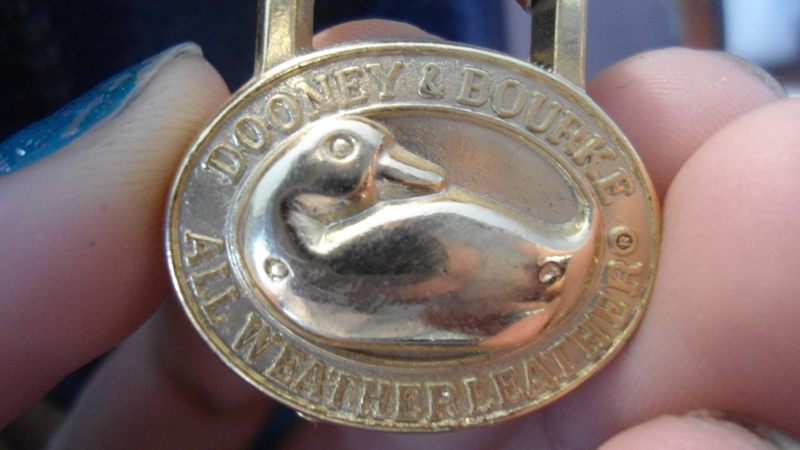 So here for the interested of other Dooney & Bourke collectors and enthusiasts is a cavalcade of fake Dooneys. 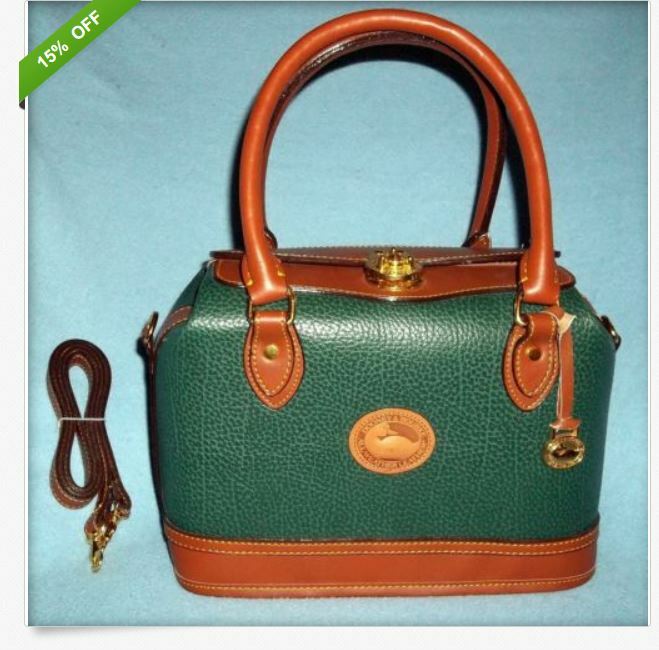 Paula I Just wanted to share the worst fake Dooney I’ve ever seen……..
Hi Paula, sorry to bother you,I know your busy. 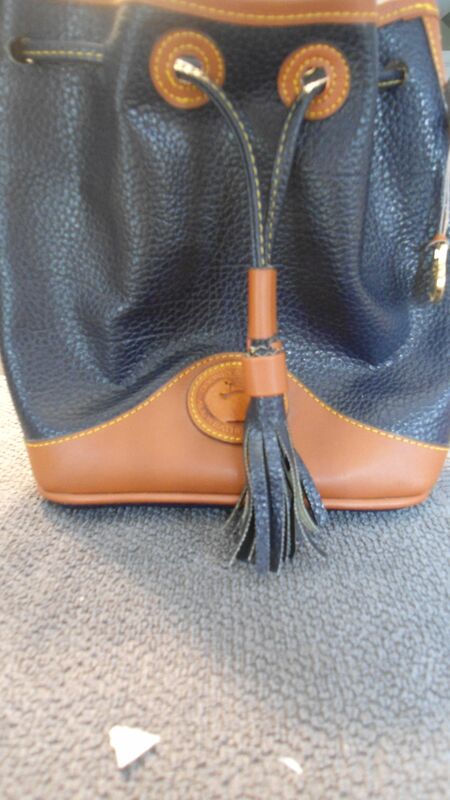 Just wanted to share with you probably the worst fake dooney and bourke handbag I have ever found. Ugh.. Thank you and never too busy to expose the fakes. And this is truly an ugh ! 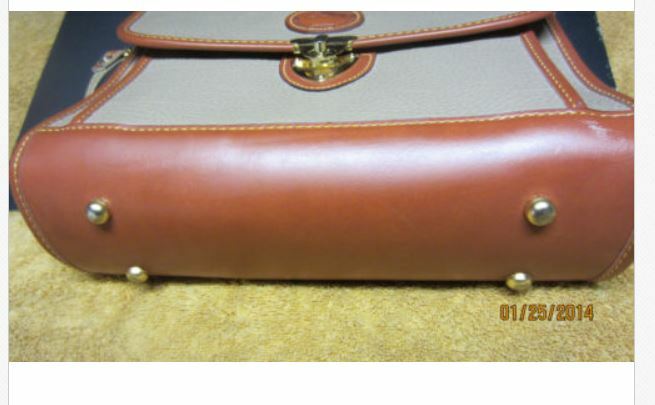 I always hope it helps sellers who sometimes unknowingly list a fake for sale. 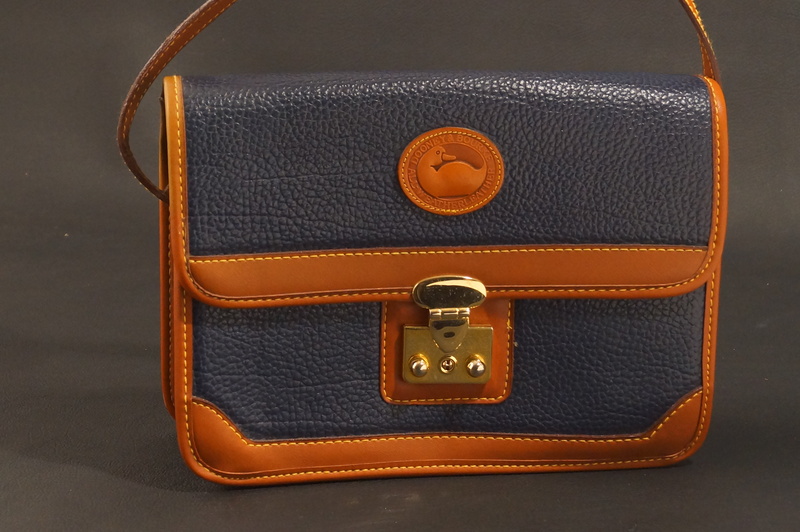 But mostly to help buyers so they don’t pay for a counterfeit handbag when there are authentic beauties out there waiting to be adopted ! 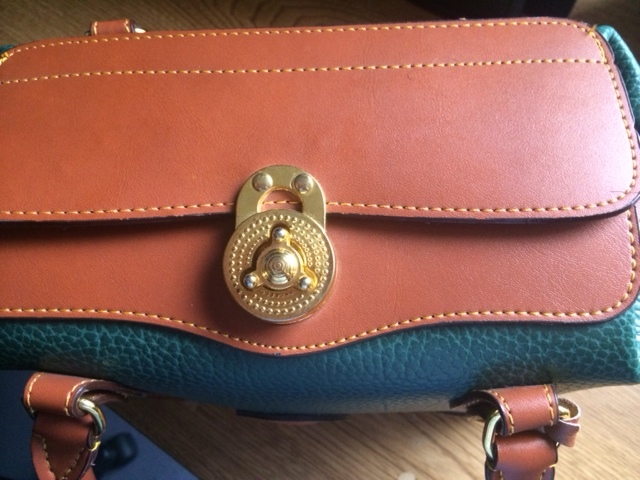 Is this an authentic Dooney satchel? 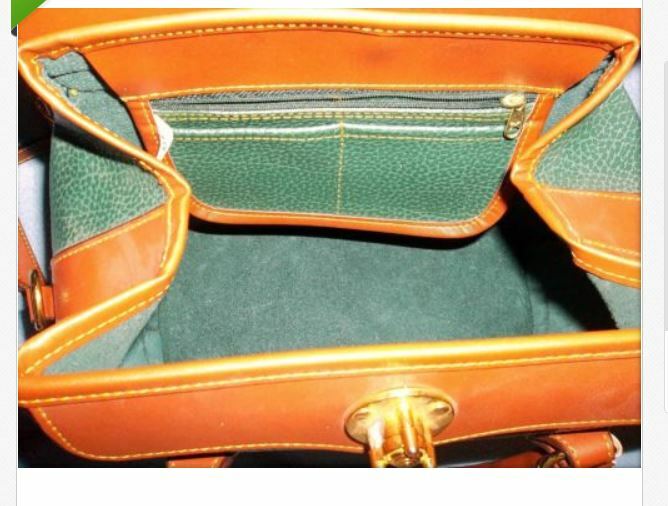 Hi Paula, I just lucked upon your website about the DB bags and was trying to find out if the satchel I have is a real one or fake. It was given to me by my Mother who purchased it at an estate sale about 5 years ago. 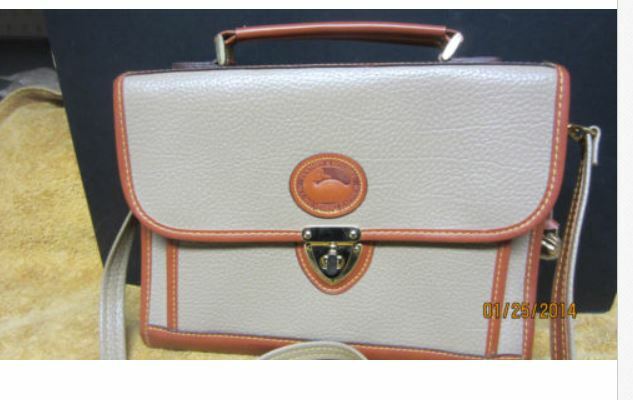 What puzzles me is that it has the workmanship of the actual bag but there is no tag inside showing a registration number. the only tag is one that says assembled in Mexico. 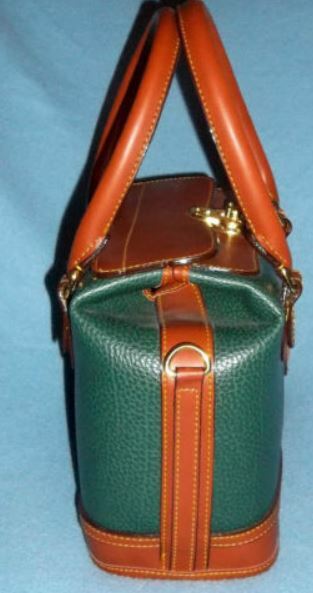 I will describe what I see of the bag. 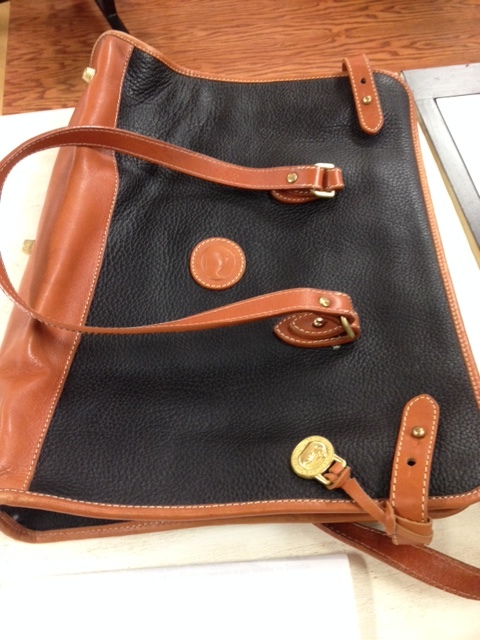 It is a black leather satchel with the tan trim and stitching, you can feel the stitching on the inside of the bag. 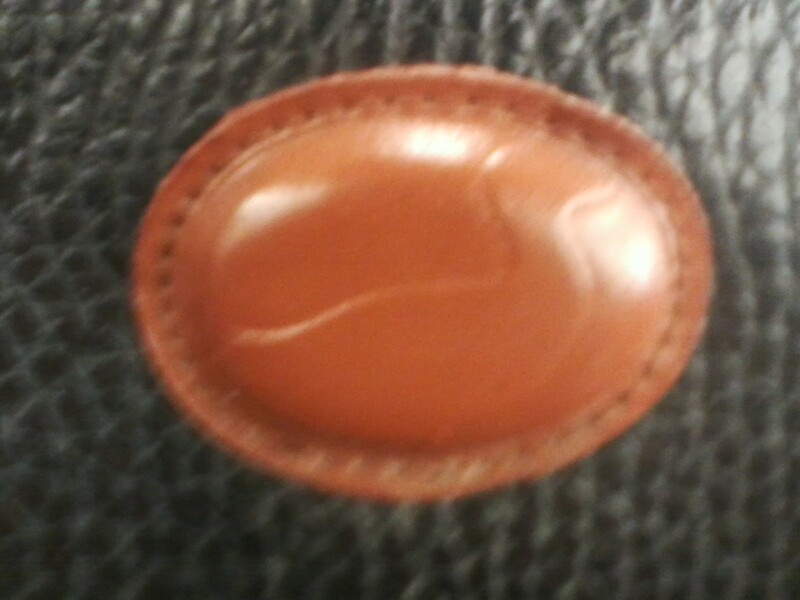 the inside is not lined and you just feel the leather it is soft. 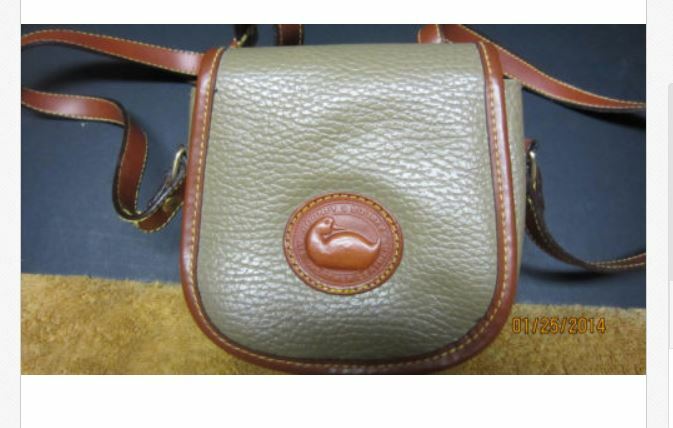 the duck logo is stitched to the bag. 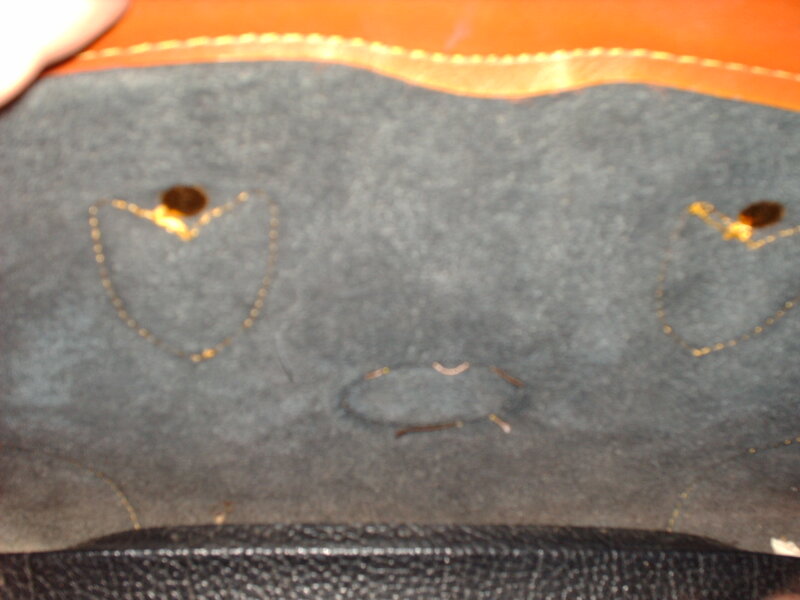 all the grommets buckles are the gold brass. 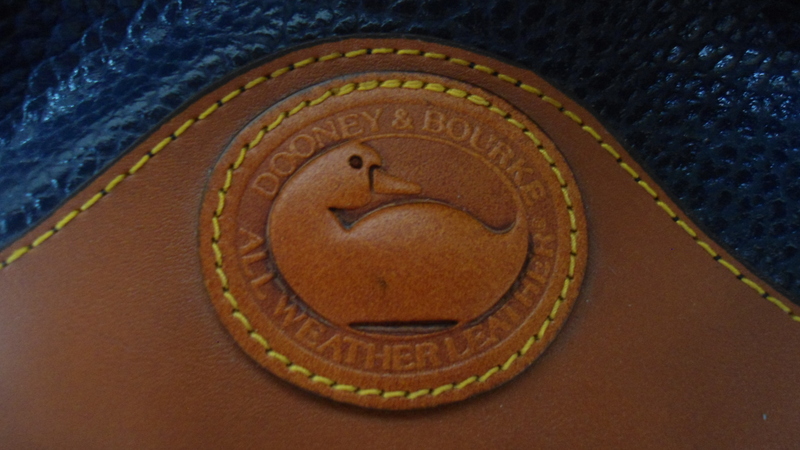 It has the duck logo on a leather strap that hangs from the handle. The Zipper has Three Star printed on it, so that and it not having a tag with a registration has got me wondering if it is real or fake. any help with this is surely appreciated! 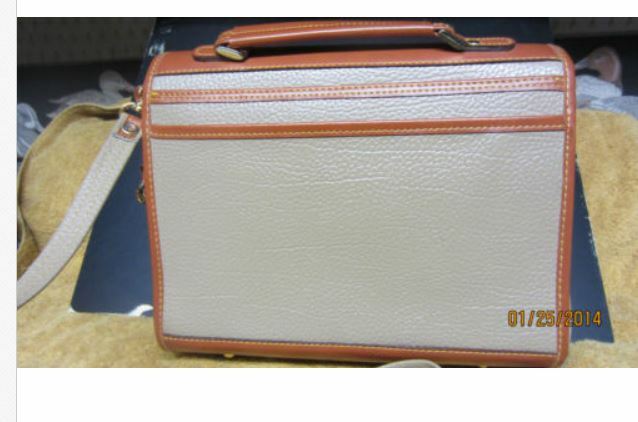 This is a counterfeit bag. 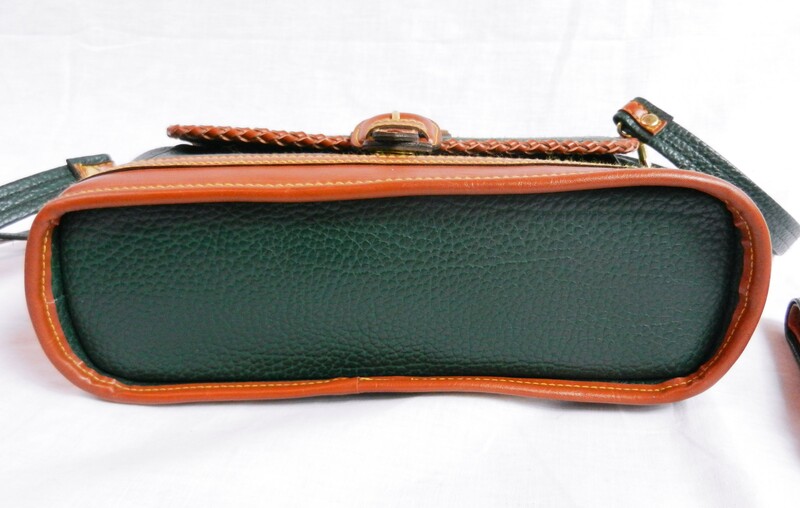 What they were probably trying to copy is one of the most coveted satchels – the Gladstone. 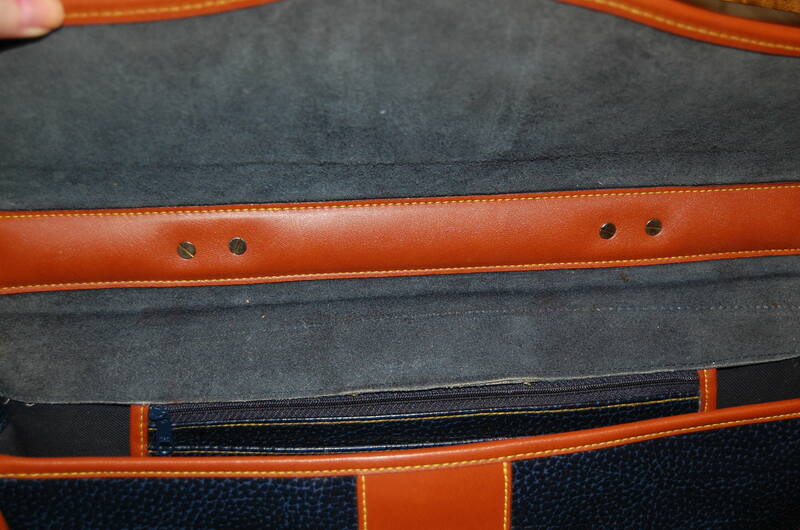 If you click on this photo, it will take you to a page that shows all the features of an authentic Gladstone in new condition. 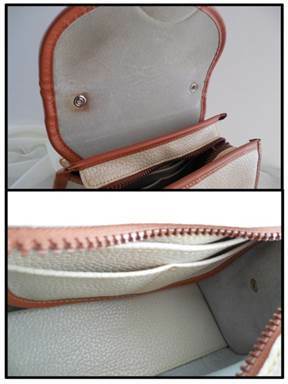 And here is another one in Taupe that is used. 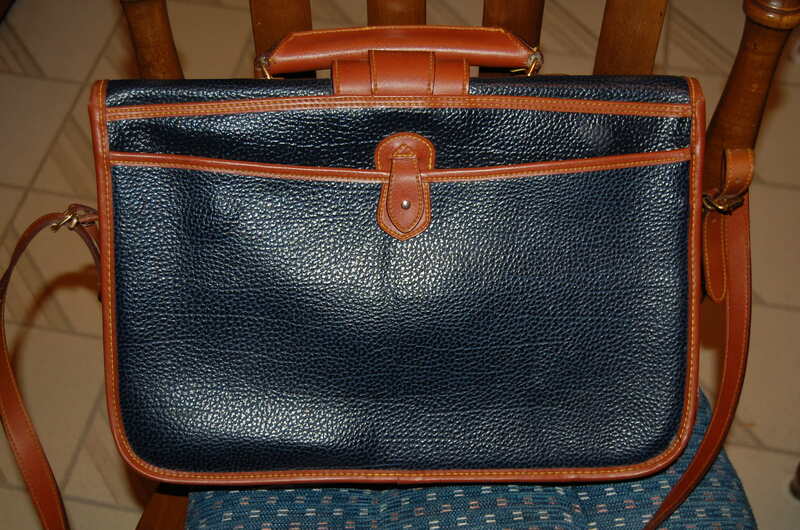 Is this Briefcase an Authentic Dooney & Bourke? 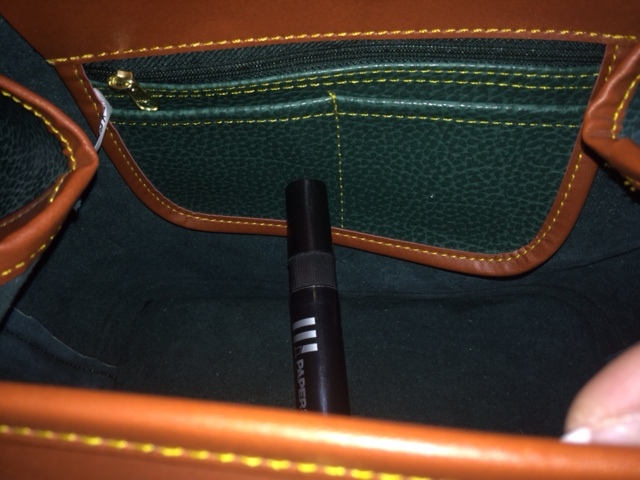 I have a Dooney & Bourke AWL briefcase that I’m not sure if it’s authentic. I looked at your website and didn’t see anything exactly like it. It is counterfeit. 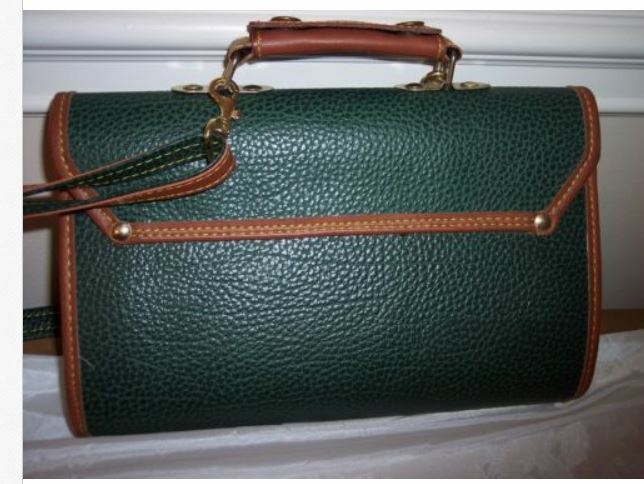 We did have one on our site but if you were looking in briefcases, it was not there because it is a tote so was in the tote section. 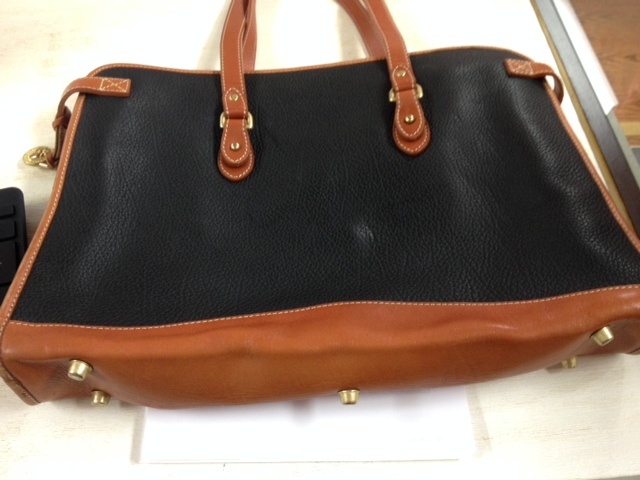 The counterfeiters were trying to copy the R41 Shopping Tote. 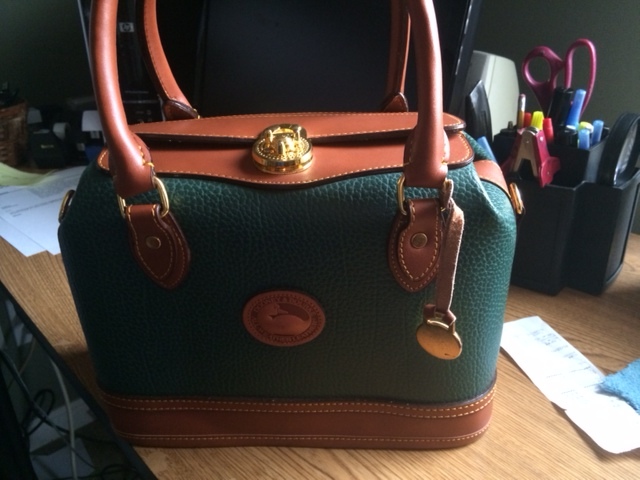 Here is a photo of an authentic tote and if you click on the photo, it will take you to a page that shows more photos and provide details. 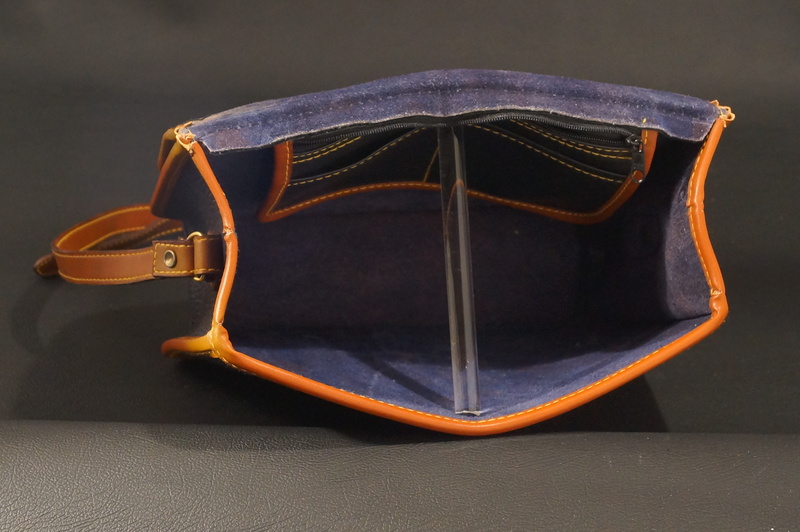 The interior should have a number of pockets. 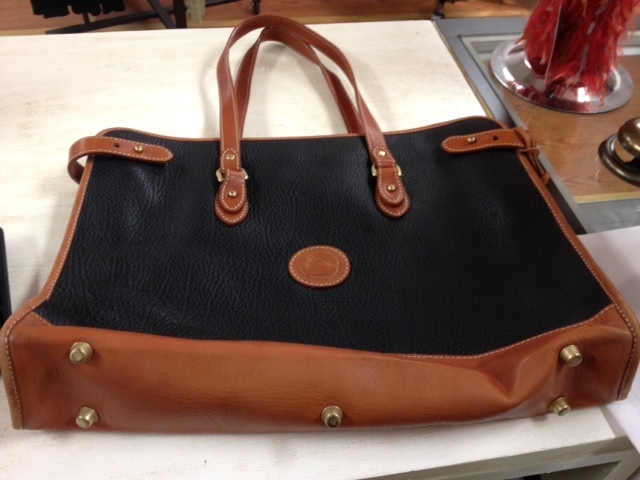 Remember, you can always buy authentic Dooney & Bourke bags on our website. 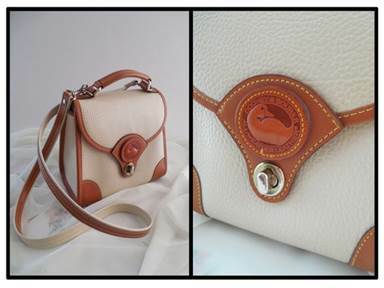 Here are some more fake Dooney & Bourke bags that are being sold as authentic. 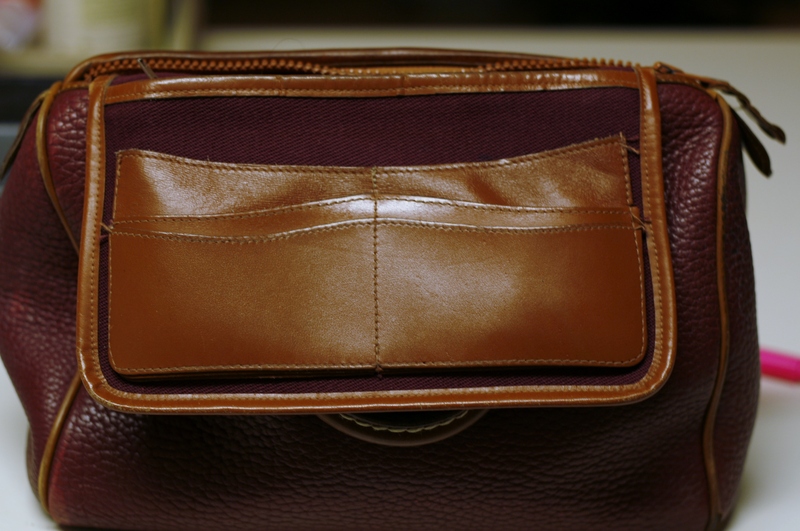 Several of you have written asking me about them……….so……….before you put down your hard-earned cash, be sure you know what you are buying ! !